Under Pressure is our new and exciting inflatable team building game which can be played by two players or by two teams. 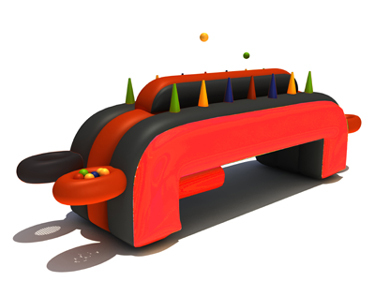 The eye catching inflatable will certainly draw attention as the game looks simple but wait till you try it! Can you keep a cool head? Take our challenge and be “Under Pressure.” This amazingly fun game involves skill, speed, timing, accuracy and dexterity. The idea of the game is to use the air from the funnels to move the ball along the game. The winner is the first person or team to move all five balls from one end of the game to the other. Perfect for the whole family, this activity is a great addition for any of our Activity Days. Whether you wish to use this as a fun but challenging game at Team Building Activity Day or simply a way of entertaining both adults and children at your Family Fun Activity Day, this game can entertain both adults and children.